With your Sarasota Ceiling Contractor who specializes in Popcorn Ceiling Removal, Popcorn Ceiling Repair, Drywall Repair, and Texture Ceilings and Walls, Arrow Ceiling understand what you need. 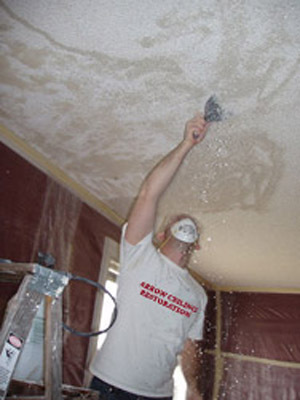 We are the leading experts for Popcorn Ceiling Removal in Sarasota, Florida! Let us update and beautify your Sarasota home and give your ceilings a fresh, new texture or smooth look that will update your Sarasota home. You can count on your Sarasota Ceiling Contractor to be on time, to do the job with little disturbance to your day to day life, and to do it at the RIGHT PRICE. Arrow Ceiling is the expert with Sarasota Ceilings. We do the job right the first time, saving you time and money. We've been serving the Sarasota Area for over 24 years. Our customers rely on our diverse expertise with each project. You never know what you're going to run into with a Sarasota Ceiling project, but rest assure... we'll know just how to get you project finished to completion. We know your Sarasota home is one of your most important assets. Your satisfaction is our most valuable asset with Popcorn Ceiling Removal and Texturing for your Sarasota home. That's why not only will we earn your future business, but we hope that our professionalism is worthy of your referrals. The more you look up, the more you realize how distracting an unsightly ceiling can be. You can trust your project with the Sarasota Ceiling experts. We specialize in a variety of textures and finishes to compliment your style, along with painting.